I count myself among the people who are fascinated by sharks, but why am I? Why is anyone for that matter? My theory is it’s in the same vein as people who slow down to check out an accident. (I don’t do this BTW!) It’s facing a fear that ultimately makes us feel grateful. We think: Thank God, I’m not anywhere close to that monster! Yes, that’s right. Sharks scare me! Don’t get me wrong—though—it’s not that I have an obsessive fear or anything. 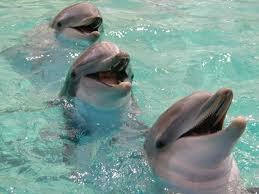 I don’t dream about them and have no problem swimming in the ocean. I even used to SCUBA. 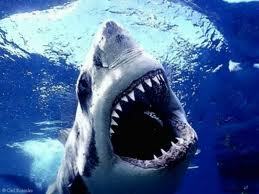 But, I imagine, coming face to face with a Great White would be terrifying. TV programming this week will let us confront the shark. So cheers for all us who shiver when thinking of these beasts and then plunk ourselves down to watch a few episodes of some nature show during Shark Week. And once I’m through with that, I’d like to focus on something that really makes me smile. Aaaah! That’s more like it. Now, when are we gonna’ have Dolphin Week? August 3, 2011. Tags: dolphins, fears, sharks. Uncategorized. My daughter loves shark week, so I watched a few minutes with her last night. Unfortunately it was an episode about shark attacks. I won’t be swimming in the ocean for awhile. Bring on the dophins! August 3, 2011 at 8:36 pm. Permalink. August 3, 2011 at 9:12 pm. Permalink.